In the late 1980s, Bud Warns teamed up with fellow veteran Dave Zien, then a state legislator, to build a memorial for veterans in the space near Bud’s house. Construction began on what would become Peace Memorial Park in 1990, and the park remained largely unchanged for nearly 30 years. Earlier this year, however, nearly $150,000 was invested into the park to give it a fresh look and new features. 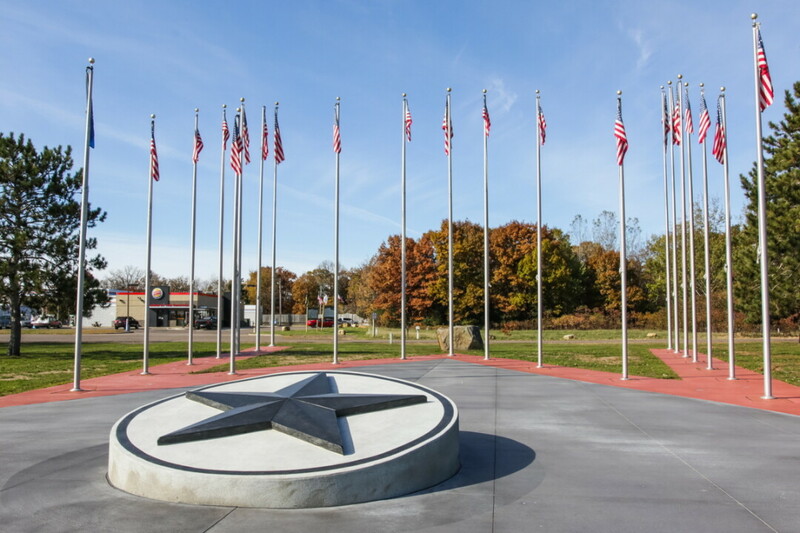 Located off Business Highway 53 in Lake Hallie, the park still has the familiar array of flags, but now includes some modern updates to make it more welcoming to the community. Fresh concrete has been laid from the parking lot up to each flagpole, giving easier access to those with mobility issues. Under each flagpole is a plaque honoring the original donors, along with new lighting to help illuminate the flags.Another new feature is the kiosk built near the walkway into the park. A wooden structure stands under a small roof, holding a new plaque that explains the purpose of the park. Accompanied on the opposite side is a separate plaque listing new donors, with empty spaces for additional donors who choose to add a remembrance. “It will just make the whole thing more inviting for the community so they can come out here and maybe want to do a picnic out here or maybe a family gathering,” Chairman Rob Larscheid said in an interview with WEAU-TV earlier this year. Larscheid also mentioned that this is only the first phase of the project, with future plans currently under consideration.